HoloLens includes a world-facing camera mounted on the front of the device which enables apps to see what the user sees. Developers have access to and control of the camera just as they would for color cameras on smartphones, portables, or desktops. The same universal windows media capture and windows media foundation APIs that work on mobile and desktop work on HoloLens. Unity has also wrapped these windows APIs to abstract simple usage of the camera on HoloLens for tasks such as taking regular photos and videos (with or without holograms) and locating the camera's position in and perspective on the scene. These modes are subject to change prior to HoloLens 2 general availability. When HoloLens takes photos and videos, the captured frames include the location of the camera in the world, as well as the perspective projection of the camera. This allows applications to reason about the position of the camera in the real world for augmented imaging scenarios. Developers can creatively roll their own scenarios using their favorite image processing or custom computer vision libraries. "Camera" elsewhere in HoloLens documentation may refer to the "virtual game camera" (the frustum the app renders to). Unless denoted otherwise, "camera" on this page refers to the real-world RGB color camera. The details on this page cover Media Foundation Attributes, however there are also APIs to pull camera intrinsics using WinRT APIs. 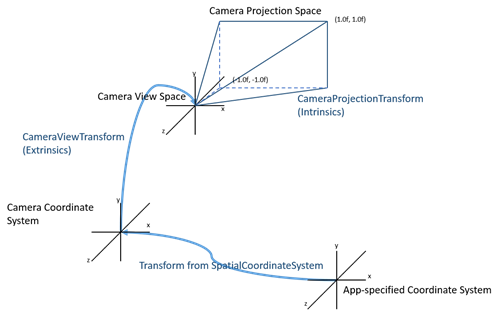 The projection transform represents the intrinsic properties (focal length, center of projection, skew) of the lens mapped onto an image plane that extends from -1 to +1 in both the X and Y axis. Locatable camera in Unity: CameraToWorldMatrix is automatically provided by PhotoCaptureFrame class(so you don't need to worry about the CameraCoordinateSystem transforms). Locatable camera in DirectX: Shows the fairly straightforward way to query for the transform between the camera's coordinate system and your own application coordinate system(s). To find the actual world location of a point, you'll need either: two world rays and find their intersection, or a known size of the points. On HoloLens, the video and still image streams are undistorted in the system's image processing pipeline before the frames are made available to the application (the preview stream contains the original distorted frames). Because only the projection matrix is made available, applications must assume image frames represent a perfect pinhole camera, however the undistortion function in the image processor may still leave an error of up to 10 pixels when using the projection matrix in the frame metadata. In many use cases, this error will not matter, but if you are aligning holograms to real world posters/markers, for example, and you notice a <10px offset (roughly 11mm for holograms positioned 2 meters away) this distortion error could be the cause. The Device Camera frames come with a "Camera To World" transform, that can be used to show exactly where the device was when the image was taken. For example you could position a small holographic icon at this location (CameraToWorld.MultiplyPoint(Vector3.zero)) and even draw a little arrow in the direction that the camera was facing (CameraToWorld.MultiplyVector(Vector3.forward)). Many mixed reality applications use a recognizable image or visual pattern to create a trackable point in space. This is then used to render objects relative to that point or create a known location. Some uses for HoloLens include finding a real world object tagged with fiducials (e.g. a TV monitor with a QR code), placing holograms over fiducials, and visually pairing with non-HoloLens devices like tablets that have been setup to communicate with HoloLens via Wi-Fi. An image pattern recognition toolkit, such as QR code, AR tags, face finder, circle trackers, OCR etc. Behavior which moves the calibration space to align the modelled tags with the real-time tags (we are careful to move the parent space, not the modelled markers themselves, because other connect is positions relative to them). Note: If you are trying to create your own Mixed reality capture (MRC), which blends holograms with the Camera stream, you can use the MRC effects or enable the showHolograms property in Locatable camera in Unity. If you'd like to do a special render directly on the RGB Camera stream, it's possible to render holograms in space from the Camera's position in sync with a video feed in order to provide a custom hologram recording/live preview. In Skype, we do this to show the remote client what the HoloLens user is seeing and allow them to interact with the same holograms. Before sending over each video frame through the Skype service, we grab each frame's corresponding camera data. We then package the camera's extrinsic and intrinsic metadata with the video frame and then send it over the Skype service. On the receiving side, using Unity, we've already synced all of the holograms in the HoloLens user's space using the same coordinate system. This allows us to use the camera's extrinsic metadata to place the Unity camera in the exact place in the world (relative to the rest of the holograms) that the HoloLens user was standing when that video frame was captured, and use the camera intrinsic information to ensure the view is the same. Once we have the camera set up properly, we combine what holograms the camera sees onto the frame we received from Skype, creating a mixed reality view of what the HoloLens user sees using Graphics.Blit.